Just recently ordered the TBH rifle deal through Alamo Precision. Checking out all the custom builds really got me thinking about building a custom lightweight mountain rifle in the future. Was thinking 300WM and as light as possible. With no budget in mind what type of things would y'all look at for this type of rifle? It would need to be capable of hunting elk, moose, or bear. Any other calibers suggested? Hope you like recoil! My “mountain rifle” is a .30-06 That comes in at 7.5 lbs scoped, around 6.5 lbs bare. I felt it was the best combination of light enough to carry easily but heavy enough to shoot well, and with enough power to get the job done without generating a flinch. As for caliber, consider the .300 WSM. Does everything its brother does in short action. I have a Mark Bansner in .300 WSM that weighs in at 6 pounds 4 oz. bare. It does not have a brake and has a little bite to it. Fierce Firearms is making some really sharp sub 6.5# rifles. Really impressed with their stock ergo. I’m trying to decide between a custom build with a Lone Peak Ti action, Proof Light Sendero barrel, McMillan edge fill stock, etc or something along the lines of a Cooper 92 Backcountry. Either one serves the purpose. APR builds rifles that flat out shoot but so does Cooper (I’ve got both). At the end of the day it comes down to personal preference and I still don’t know what I’m gonna do. The Cooper is certainly a lot cheaper and it carries a 1/2 MOA guaranty. But I like having my fingerprint on a gun. I bought one of these in 280 AI and I love it. I’m in the middle of a lightweight build. I went with a pierce precision titanium featherweight action. The big difference is the bolt is titanium in the pierce vs the other titanium actions. Another big weight saver was the javelin spartan 300 bipod at only 5.2oz. I went back and forth on a proof barrel but the weight savings isn’t what most think when you compare light contour steel barrels to carbon barrels. The other components were all lightweight but those two components is where I saved the most. Hunt In: East Texas, Chromo CO. Fierce builds off a Sako clone action in titanium, which is IMO a hundred times better than a Rem 700 action that most customs use. Full disclosure, I have customs in a 700, and factory Sakos, but not a Fierce. Nice! Please share all of the specs. Congrats. Great looking rifle! What Barrel length and cartridge did you with? I settled on the Bart 2B. Chambering in 7SAUM and leaning towards 23” Barrel. Yes. I actually posted on a thread here a few years ago when someone posted pics and said I would buy it if he ever sold it. The dude actually PM’d me way later about selling it and I bought it. I’m looking to be around 6-6.5 pounds bare. I’m fine with handling recoil for the amount of shot that will be taken. This will not be a target rifle so it won’t be getting that much range use other the sighting in and load development. It’s sole purpose will be hunting on backpack trips. With that said I am still open to other calibers. 300 WM was just what I was most familiar with. This is all still just in the idea phase so still not sure when or what I’m going to do. I would prefer doing a custom build over buying a factory rifle. I have some the most fun with deciding what parts to pick to get the perfect finished product. Which species of bear? Personally, I'd go with the Kimber in 308 for a turn-key non-custom rifle for elk and black bear....moose can be done with it as well although it might be a bit light. I have been planning to taking some Alaskan trips in the next few years so a rifle capable of taking black or brown bears would be ideal. I have also thought about 7mm RM. Had one when I was younger when hunting up north and liked it. Check out Rifles Inc. in Pleasanton. The main thing for me with a rifle to carry around in the mountains is to be able to bushwhack around and not worry about scratching it. I'd sacrifice a pound of weight to keep it in the $1k range. I would vote for the 300wsm also. It is a great caliber for mountain hunting. Spouse and I both shoot 300wsm, I load 165-168 gr bonded bullets while spouse likes 180 gr bonded bullets. Lots of choices in that caliber. A short action is made for mountain rifles. Those rifles pictured above look awesome to me though and a 280 sounds very intriguing. 30 caliber just seems to work great for any species we hunt, antelope up to bison and perhaps grizz in the next year or two. Wyoming hunts may start soon with delisting. Sounds like you have lots of good resources down there, have fun with the build. 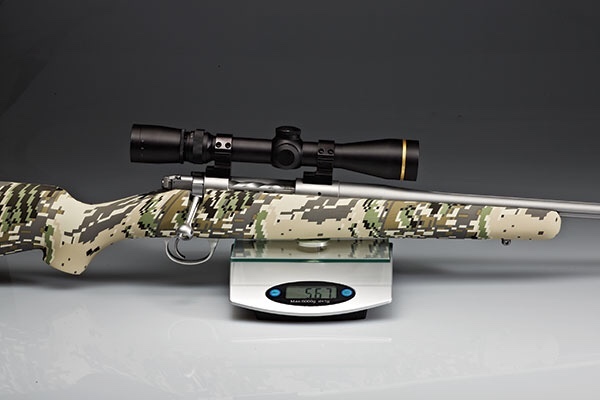 Rifles, Inc. Titanium Strata would be one I'd look at if I had the money. Kimber Mountain Ascent in 300wm. $1900 and be done with it. Awesome super light rifle, and with the muzzle break, very low recoil. My friend has one, and it's a really sweet gun. Yeah, very impressive. Warning- don’t handle one if you don’t want to be tempted like a free lap-dance. Ding ding ding!!! Pay for the good stuff and you wont be disappointed! Imagining sliding down a scree field or climbing up a creek embankment with an APR... y'all are fancier than I am. Funny you mention that. I was out at a friends shop in AZ last year visiting with him. I was telling him how nervous the CF barrels made me from a fixturing standpoint, and all of the pains we go through to baby them through the chambering process. He looked at me like I was crazy then proceeded to grab one off his rack and knocked the $#^* out his his toolbox with it then handed it to me! The dude is crazy, but I don't worry about them quite as much as I did before that little demo Seriously though, those guys hunt vertical, rocky country almost always. When they aren't building rifles they are guiding in that same country for Coues, Elk or somewhere else chasing sheep. The CF builds hold up as good or better than anything according to them. It's been my experience as well when compared to blued or cerakoted steel. CF stocks will take a lick as well. Good to know. Also I tend to look at my hunting rifles the same way I look at my trucks. Scratches and accidents are inevitable. If I wasn’t ok with that idea I wouldn’t spend that much money in the first place. Want is y’alls experience with the 28 nosler? Would it make a quality hunting round for larger game and how does the recoil tend to compare to the 300wm? Even though others have recommended some other places APR will still most likely be my first stop when I start getting into this project. The rifles y’all are building are of great quality and really liked the customer service the times I have been to the shop. 28 Nosler is an amazing round IMO. I have a couple buddies that have them and I have 1 on order. They are both shooting the 180 gr Berger vld (they order loaded ammo from gunwerks) and wow do they do some damage on animals. DRT is an understatement! Both of there's have brake so they don't kick bad at all. From what I understand the recoil is less then 300wm if you compare rifles of similar weight and no brake.